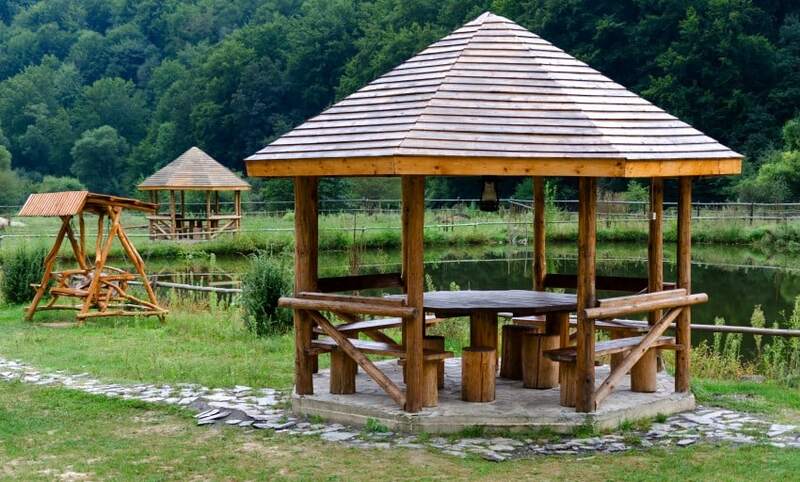 Gazebos are usually built from wood, but other materials can also be included in their design – such as brick, stone or metal. 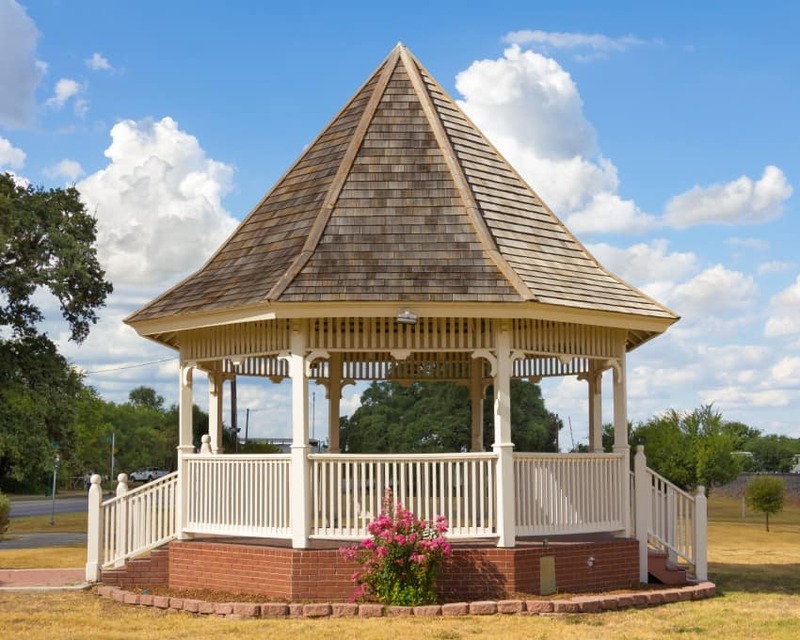 The typical gazebo is generally with a square or octagonal floor plan, with support posts in the corners, a railing between them and a roof at the top. Pavilions are also garden structures that are open on all sides and have a closed roof. 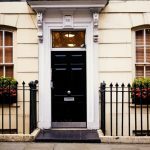 They are usually with a square floorplan and quite varied in size – they go from tiny and intimate to large enough for parties, weddings and other social events. 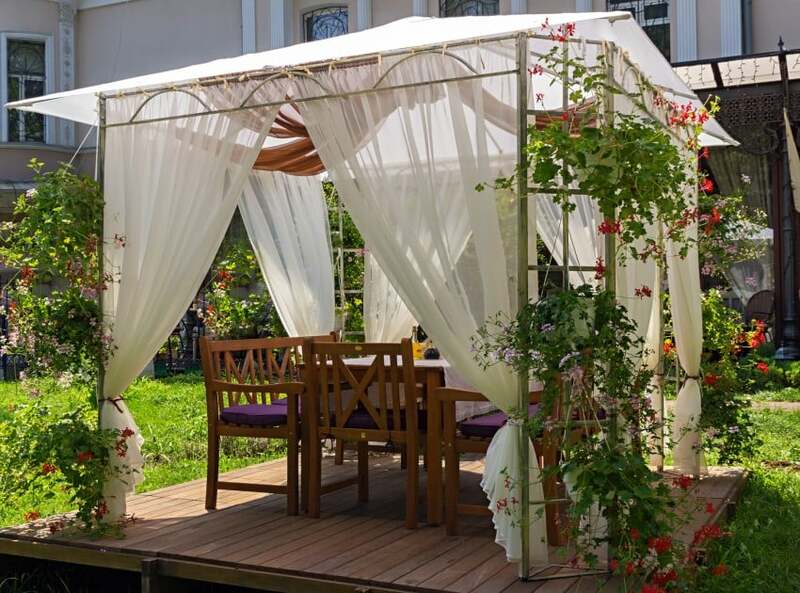 Pergolas are usually built from wood and have a square footprint. 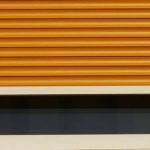 They are a popular backyard element and can be either freestanding or attached to a house. The most recognizable feature of a pergola is the open roof made of perpendicularly aligned planks of wood. 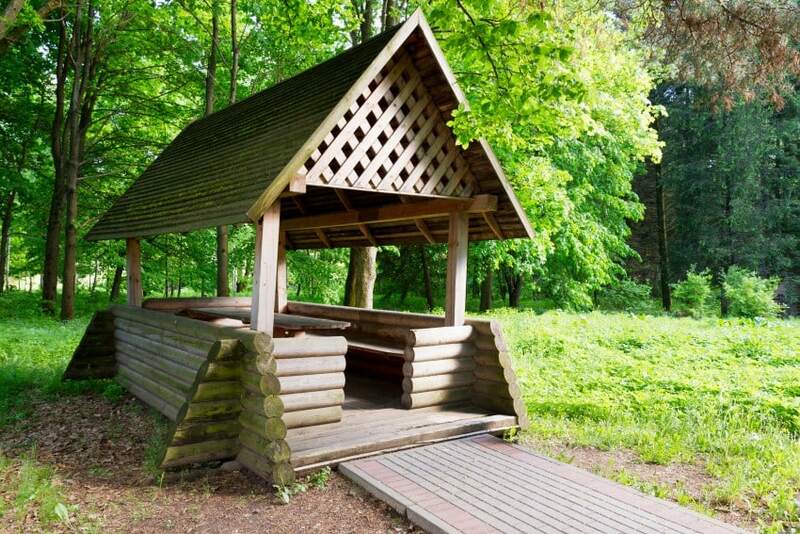 Arbors are tiny wood structures that represent a bench with a covered roof – great place for sitting down for a while. 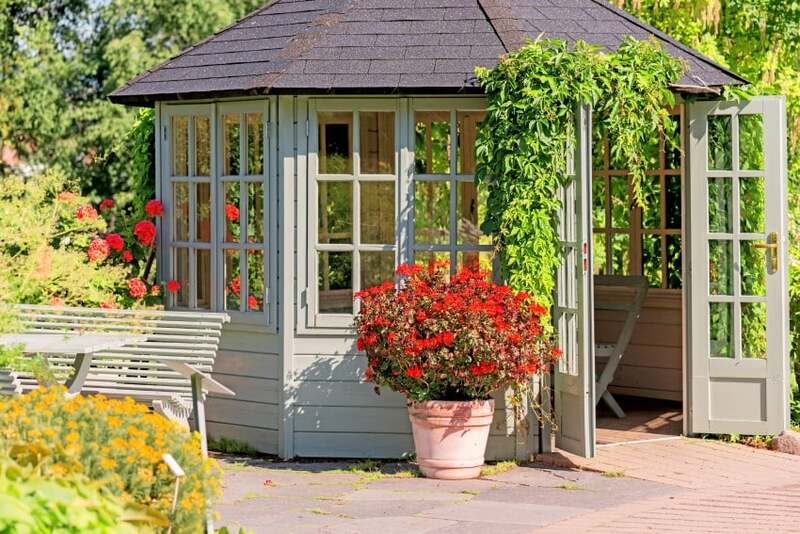 Garden kiosks are also small in size and are generally scaled down garden pavilions. The rotunda is another popular park element – it is round in shape and with a domed roof. All these are usually open on all sides, yet sheltered so they make a great place to hide from the sun or rain when outside. Often, some seating options (stools and benches) can be found on the inside that urge you to sit down and relax. Ornamental elements can be implemented in the design of a garden structure to make it a state of the art landscape feature. Let’s now see 30 images of outdoor gazebos, kiosks pavilions etc to get some ideas if you want to build one in your backyard garden. 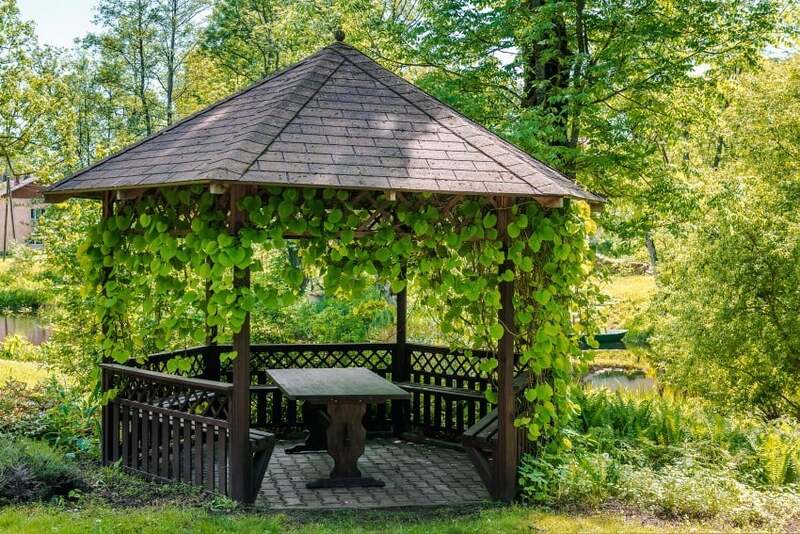 This garden gazebo is built with interlocking round logs at the base, square posts in the corners, and a steep pitched roof with a decorative criss-cross detail. Inside a large table can be found, with a sitting bench that goes all around the interior space. 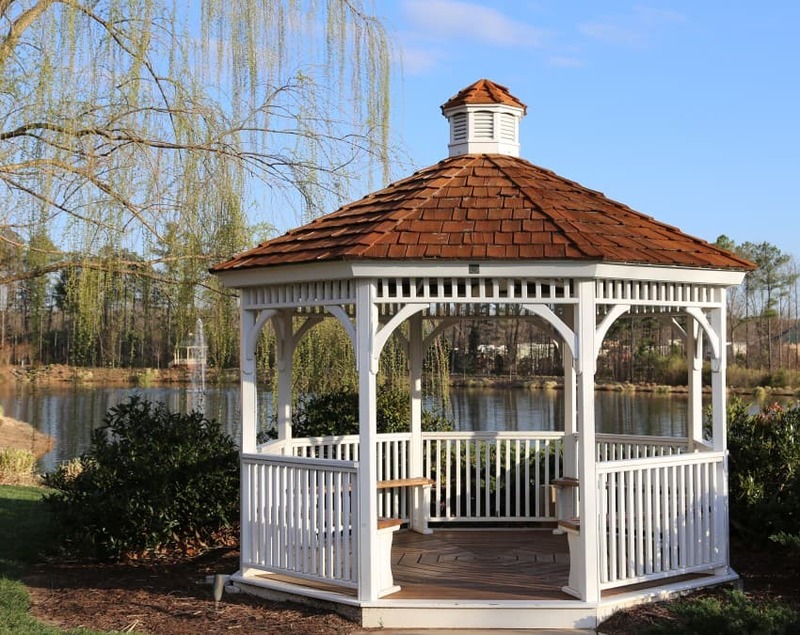 This romantic gazebo is located at the shore of a peaceful lake. It has an octagonal footprint, vertical post railings and arched roof support braces. It is painted all white and has a red tiled roof. Here is another octagonal-shaped garden structure. The natural color of the wood that it is built from is preserved and matched with a dark red roof. 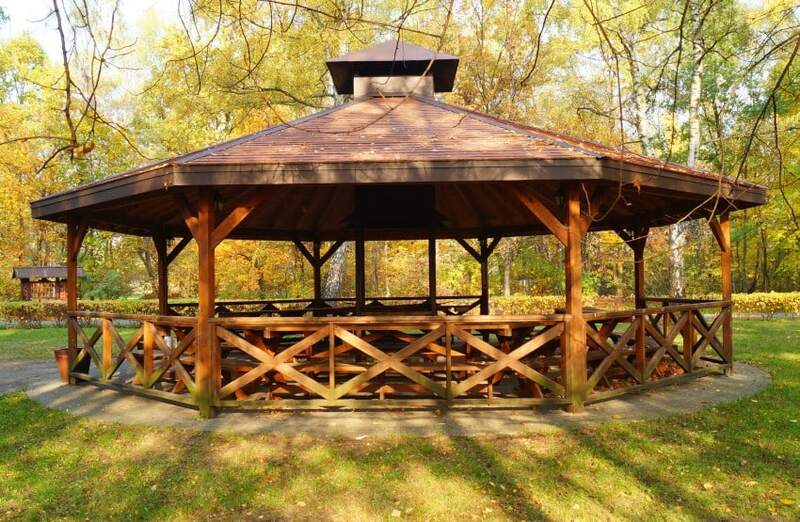 The gazebo has sitting benches on the inside and an intricately patterned wood railing. 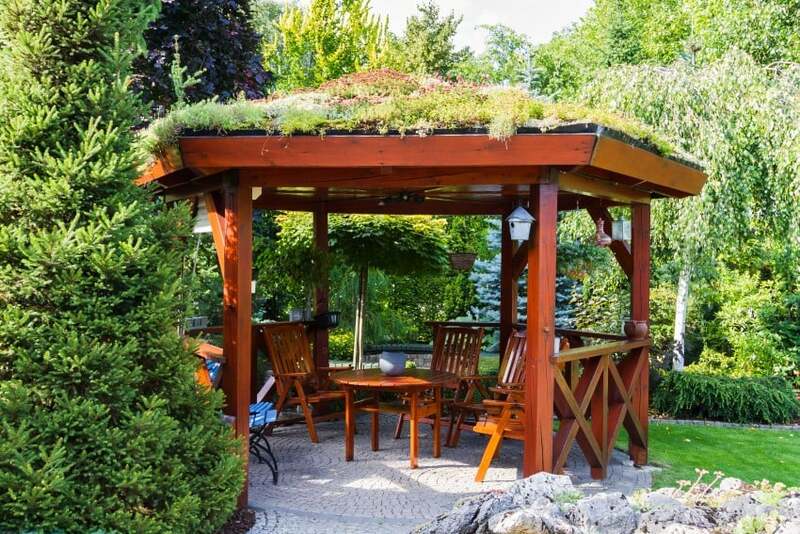 What better way to fit a garden gazebo in its surroundings than to put a green roof on top of it? It truly blends in with the setting and makes a great decorative feature in red and green. Here is an unconventional garden kiosk with a fairy tale inspired design. 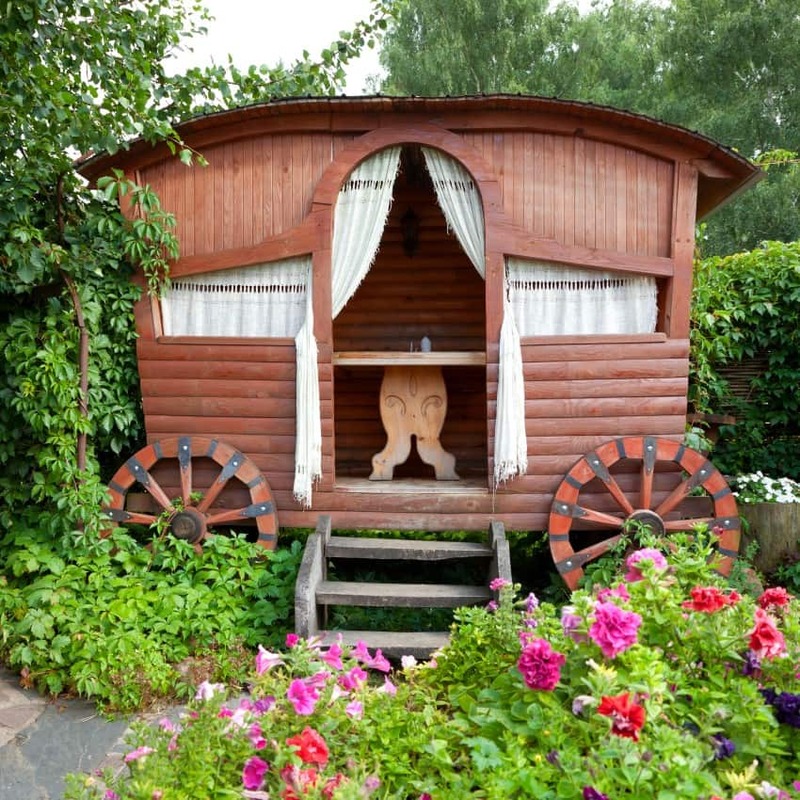 With a chariot-like appearance and white curtains hanging over the window openings it looks pretty cute and romantic. 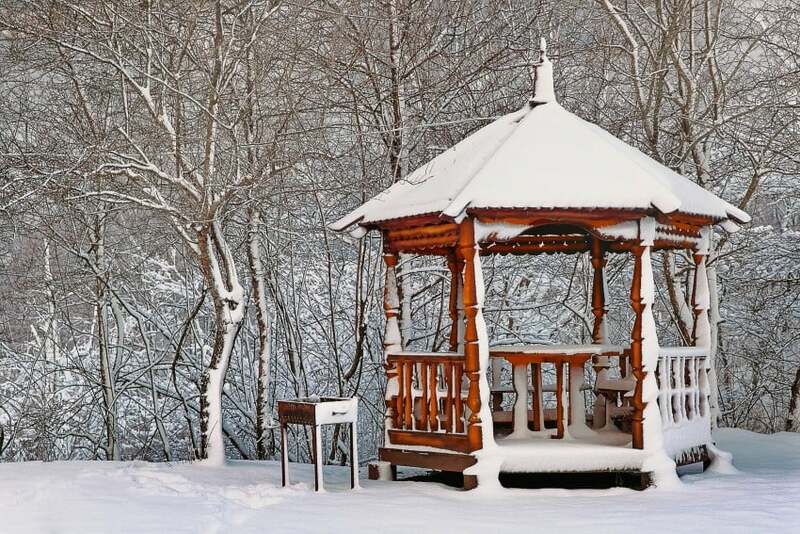 A gazebo in white always looks elegant and romantic. This one is no exception. It rests on an elevated platform with red brick steps and has a two-level light grey roof with just the right amount of detail. 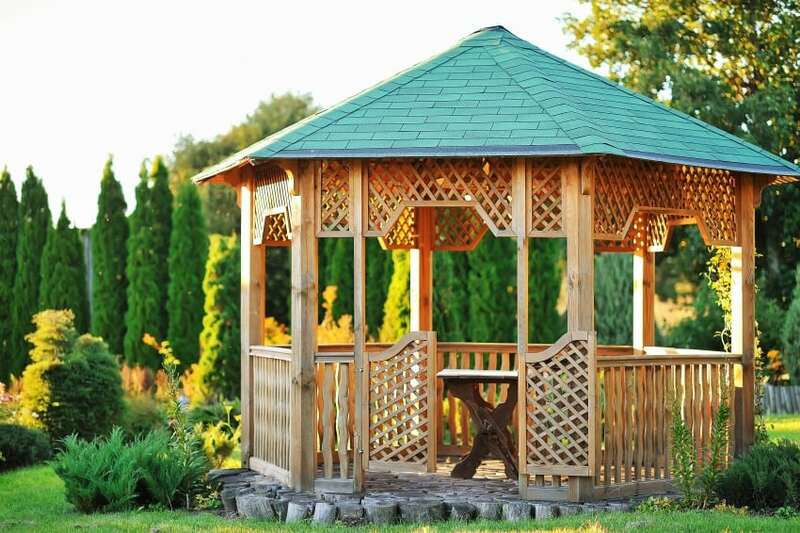 This garden gazebo has a traditional octagonal footprint. It features a log end floor, green roof and an all wood load-bearing elements and railings. It also has a criss-cross patterned swing half door. Here is a garden gazebo on an elevated platform with stone steps. Having some potted flowers hang from the roof is a great way to add some color and life to a simple design in white and grey. 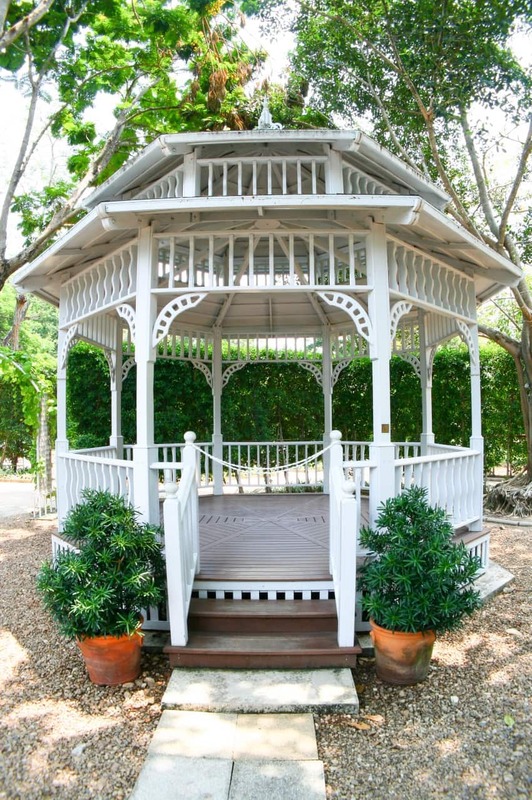 Extra small means extra cute in this gazebo design. It may be tiny but it has just enough sitting benches on the inside plus a little table in the middle. The green-colored structure and roofing help it blend in with its lush surroundings. Spending time outside can trigger your appetite. 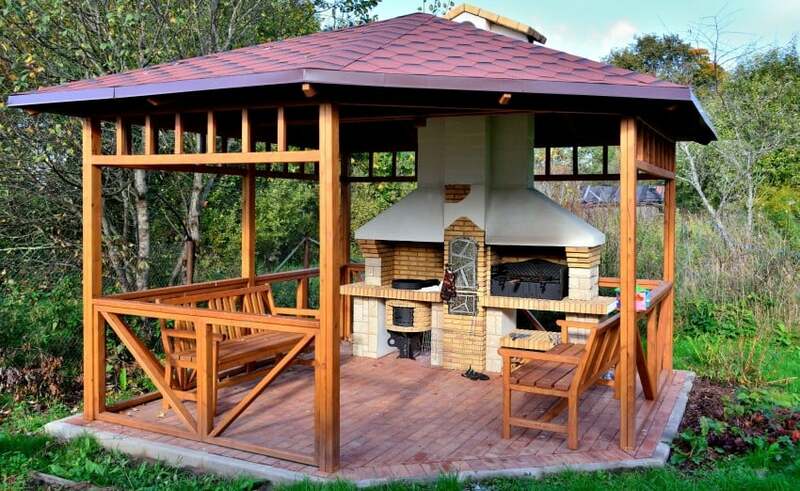 That is why it is always good to have an outdoor barbeque oven in your garden pavilion. This casual design has a cooking corner, as well as a sitting area with a pair of benches. This pavilion has a large covered area to offer to the visitors of the park that it is located in. Anyone can take shelter under its roof when it rains, or find a shady place on a hot summer day. 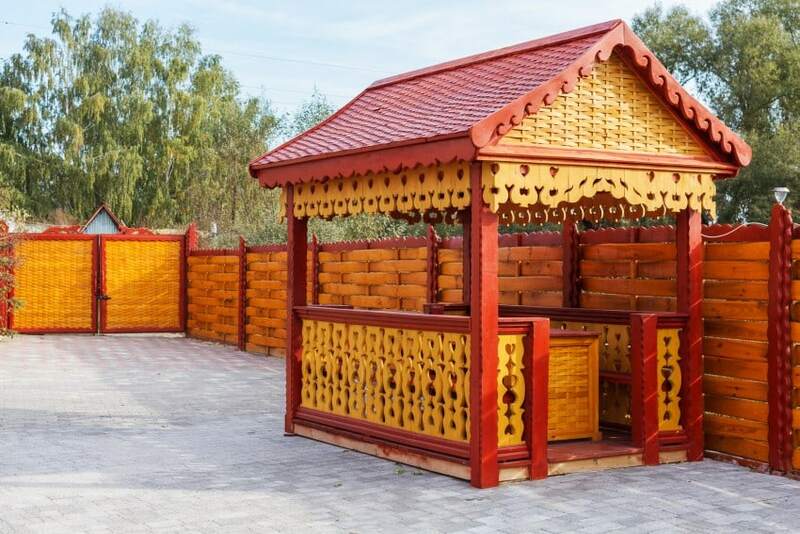 Garden kiosk are typically open structures with just a mere railing surrounding the interior space and a pitched roof providing shelter from sun and rain alike. This one however has a gridded glass door and windows for full enclosure. Gazebo structures make great observation platforms as they are open on all sides while also sheltered from both rain and sun. This lake pavilion is so nice and inviting that you can easily spend the whole day gazing at the water. A nice pergola is a great addition to any backyard. 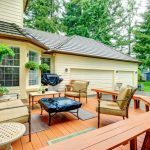 Be sure to add some comfortable garden seating to turn it into the perfect outdoor lounge area. Rattan furniture with padded seat cushions may just be the right choice. 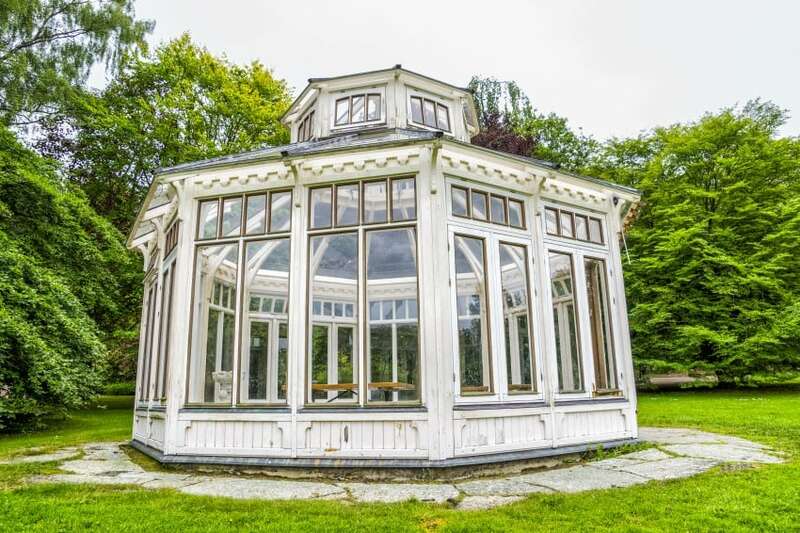 This glass garden pavilion has a charming appearance and a vintage appeal. With large windows and a multi-level roof it provides shelter from rain, wind and sun, while letting you enjoy the view of the beautiful surroundings. 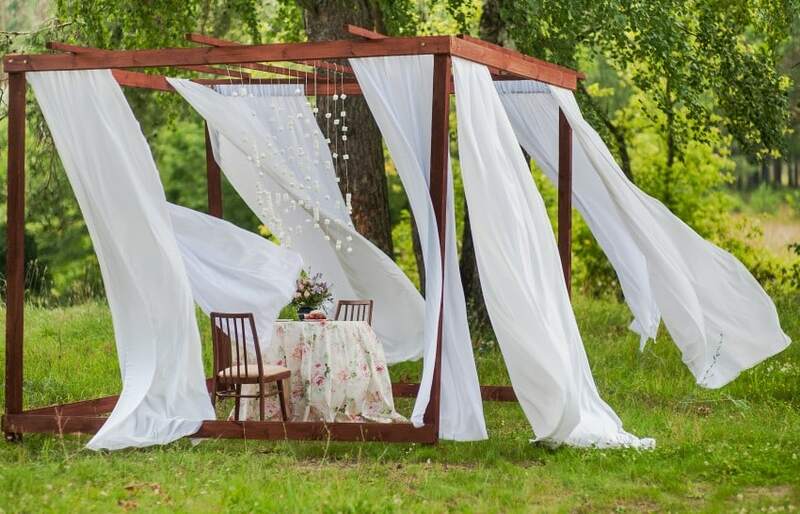 A canopy pavilion has a special appeal as it looks charming and romantic, and feels nice and breezy. Can you imagine a better place for a lazy weekend lunch with friends or family? 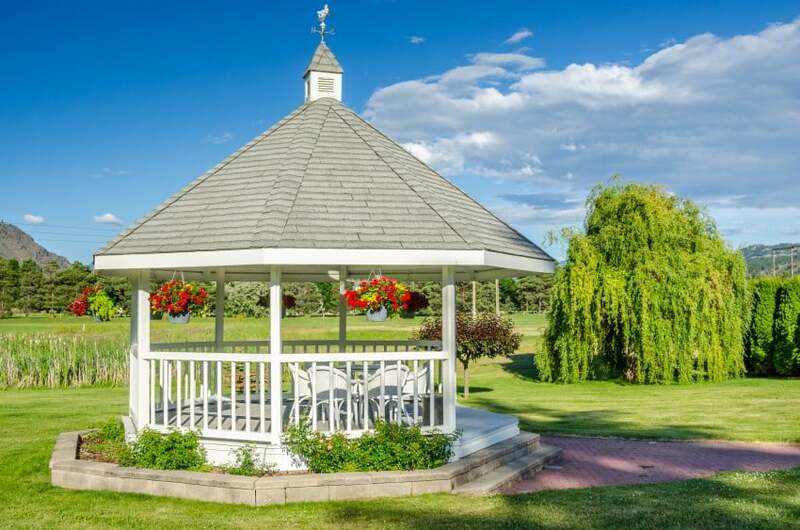 This garden gazebo sits on a green lawn. It is painted all white and has a grey roof. Potted plants on the railing add a nice decorative touch to an overall simple design. 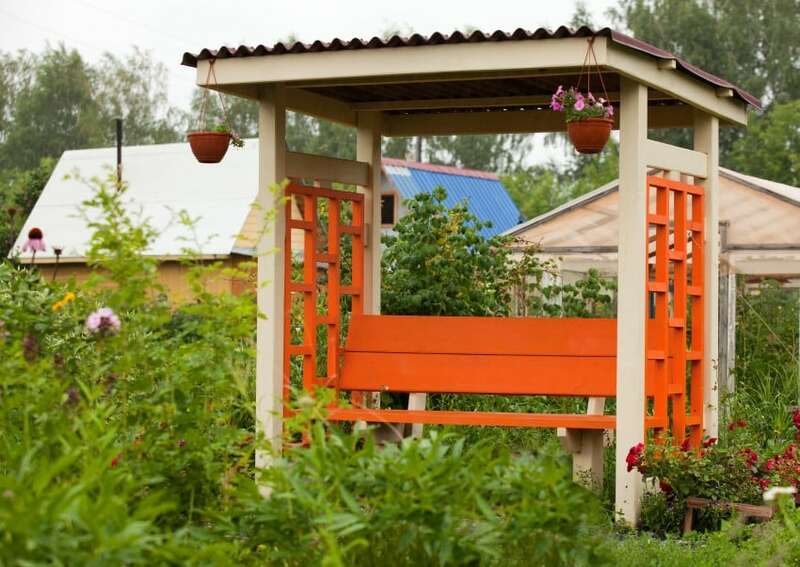 Here is a garden arbor design with a color burst in orange. It features a sitting bench under a metal sheet roof with potted plants hanging from above. This garden gazebo in dark wood has quite the dramatic appeal. It has an octagonal floor plan and a pitched shingled roof with green leaves hanging from it inspiring a sense of intimacy and secrecy. 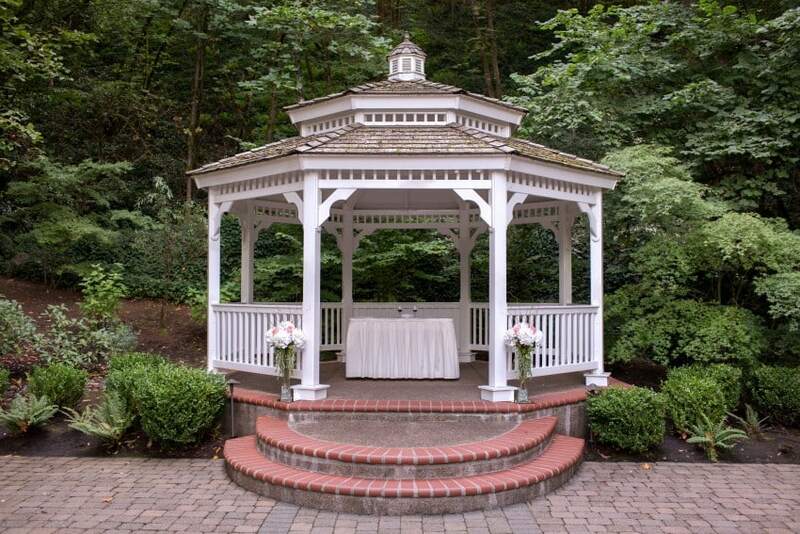 Here is a romantic garden gazebo in white. The design features an elevated floor platform with a classic octagonal outline, a multi-level pitched roof and plenty of fine details that put the finishing touch. 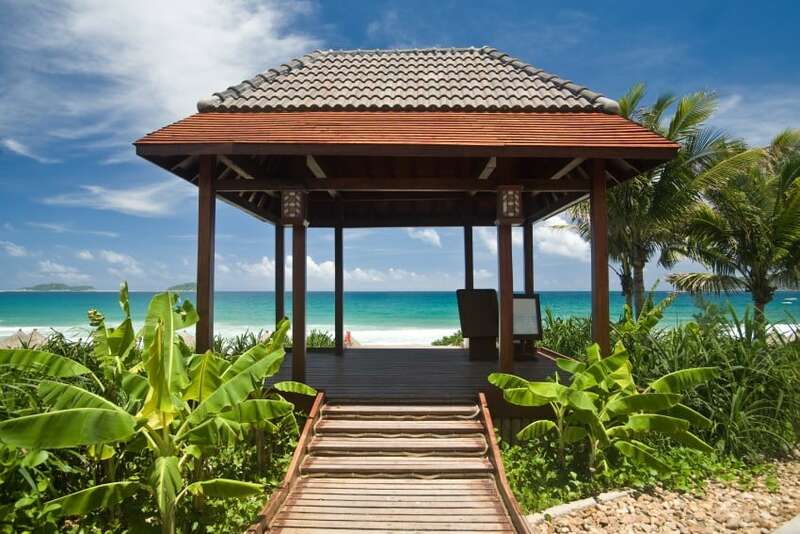 A large covered deck on the beach is the best place to take shelter from the scorching sun and enjoy the summer breeze. With no walls and no railings, nothing will get in the way of your ocean view, as the deck is totally open on all sides. 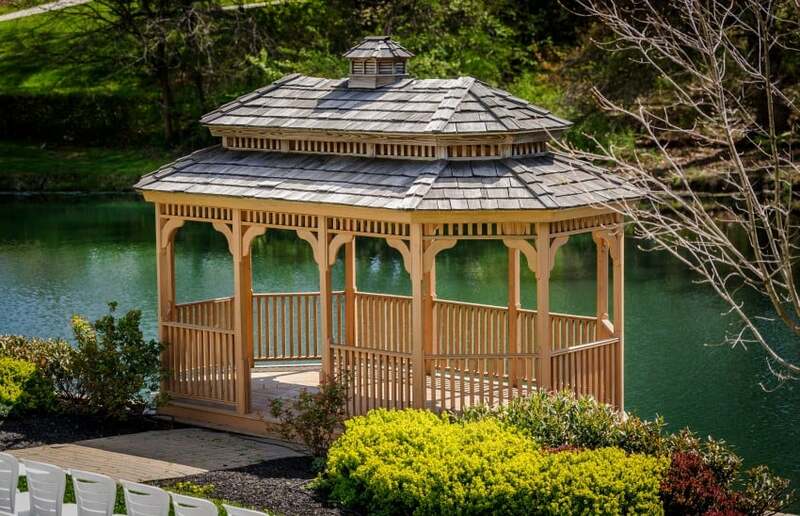 Here is a hand-crafted gazebo with a more rustic appeal. It is built of round logs and has the traditional octagonal floor plan and steel pitched roof. On the inside, there are sitting benches, stump stools and a large table. 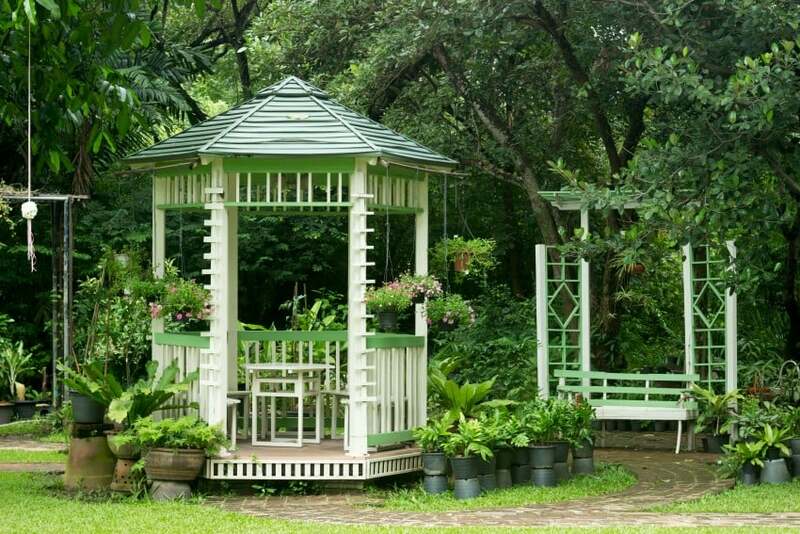 This octagonal garden gazebo has an elevated platform with wood steps leading to it, and a large sitting bench on the inside. The structural elements are all white, and the roof is in olive green. 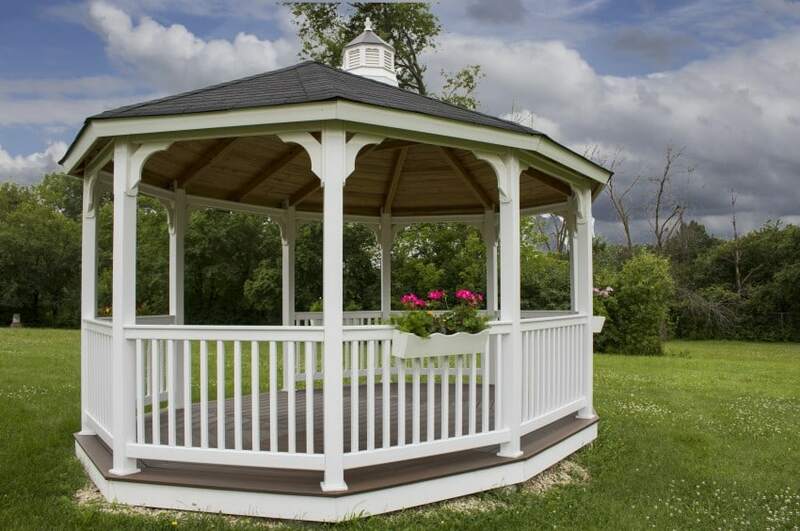 Here is a white octagonal gazebo with an excessively steep roof. It is built on an elevated red brick platform and has a set of stairs on two opposite sides. 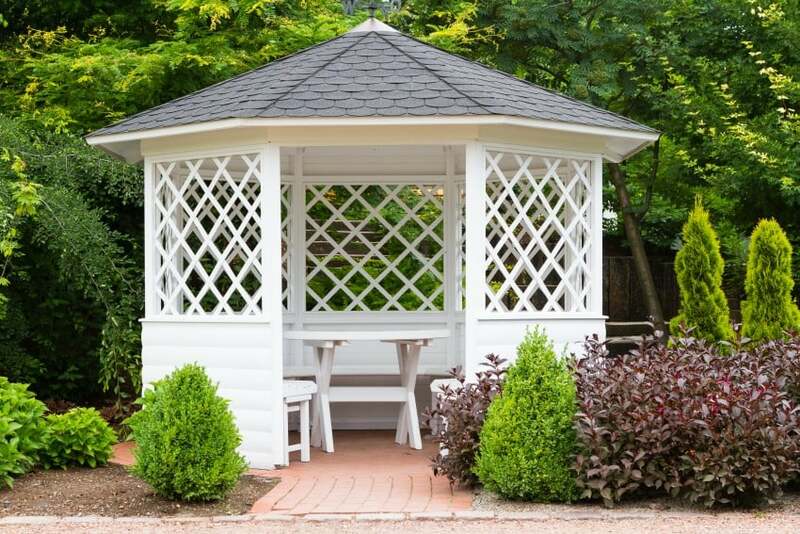 Here is a more secluded garden kiosk with criss-cross patterned screen walls in white. 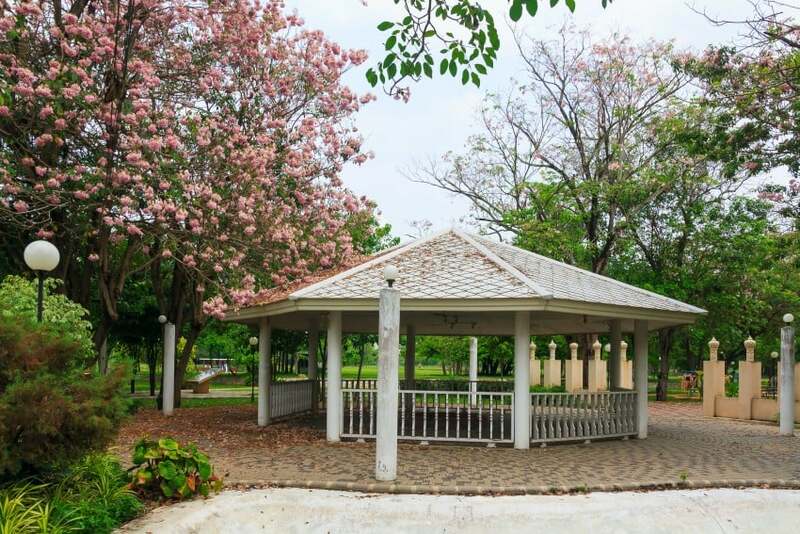 It is set in a lush green area that you can enjoy while casually chilling on the inside bench. 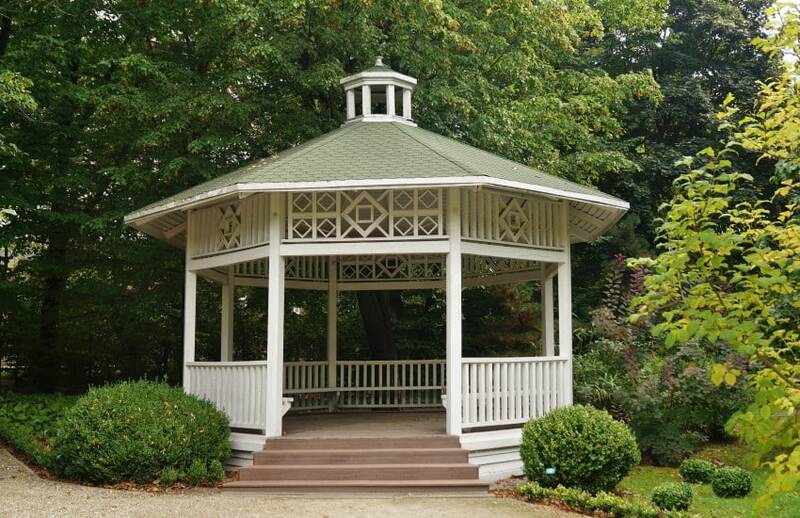 This garden gazebo design follows a traditional octagonal layout scheme with a platform and a pitched roof. It is built of red wood and is rich in decorative elements and intricate details. How can you make a simple pergola design feel exceptional? Just add white curtains to it! Take a look at this design proposal and see for yourself. Do you feel the breeze already? 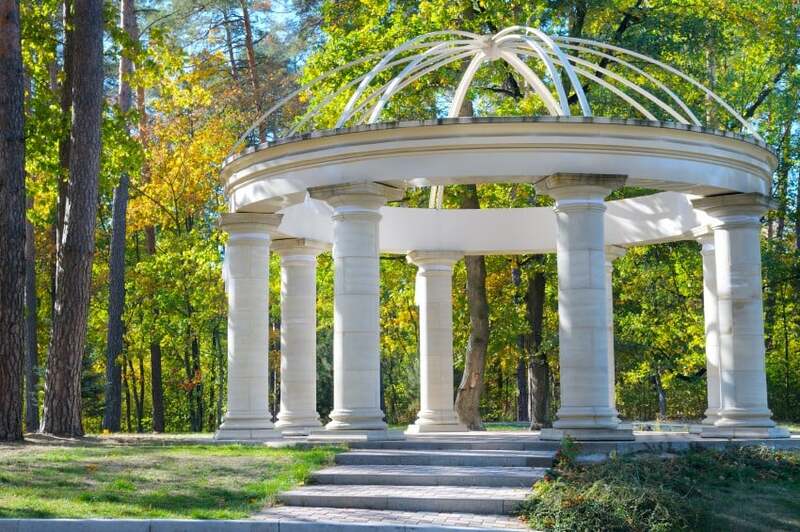 Here is a round park rotunda design that features thick round stone columns that support a steel dome-like structure. It is open on all sides with even the dome roof opening up to the sky above. Here is a simple gazebo design with a rural appeal. It is built from solid wood that has been left unpainted and has x-patterned railings and a red octagonal pitched roof. 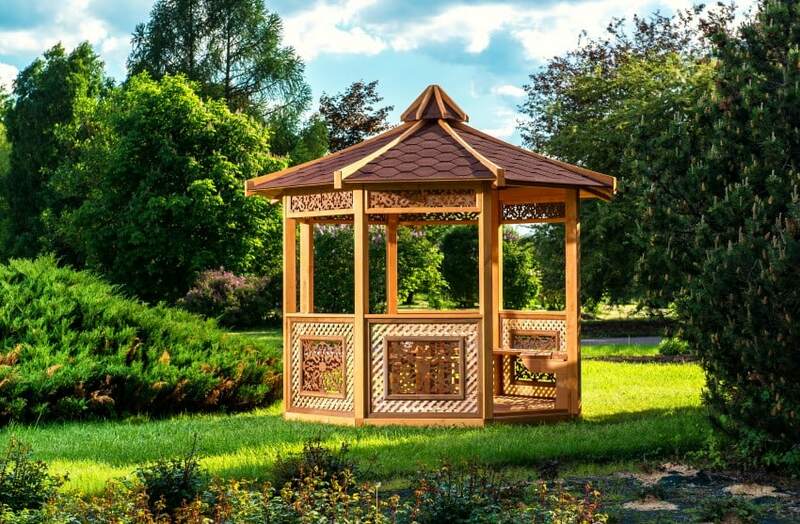 Vibrant colors and intricate patterns, detail and texture – this gazebo design has it all. 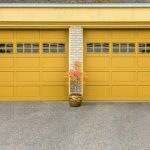 It is set in red and yellow, and features a square floor plan with a gable roof. The interior accommodates a sitting bench and a table.